Here's a Halloween decoration project so fun and creepy, you'll lose your head over it. 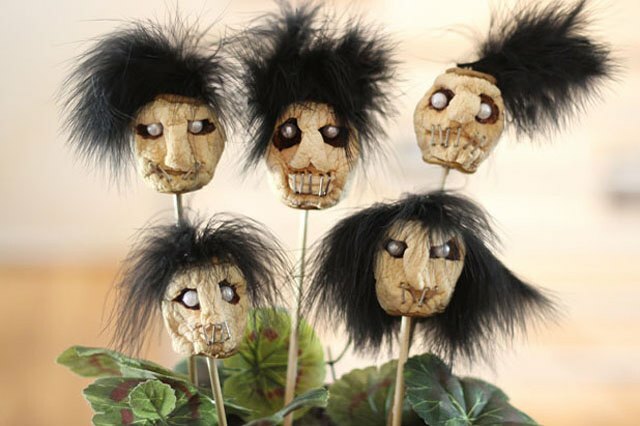 These shrunken heads are made from carved apples, which are slowly dried in the oven. 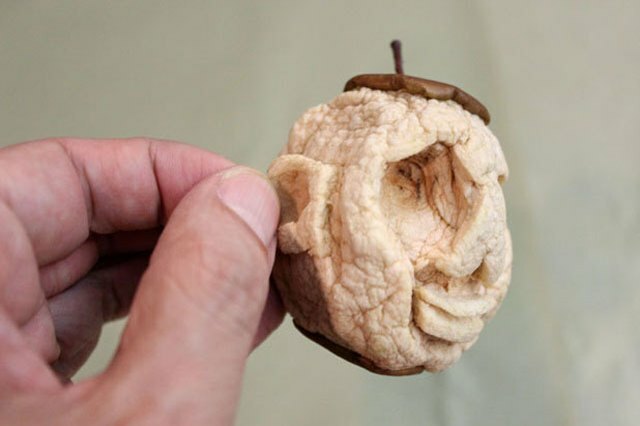 As the apples shrivel, the spooky facial features become more prominent, and each head takes on its own personality. 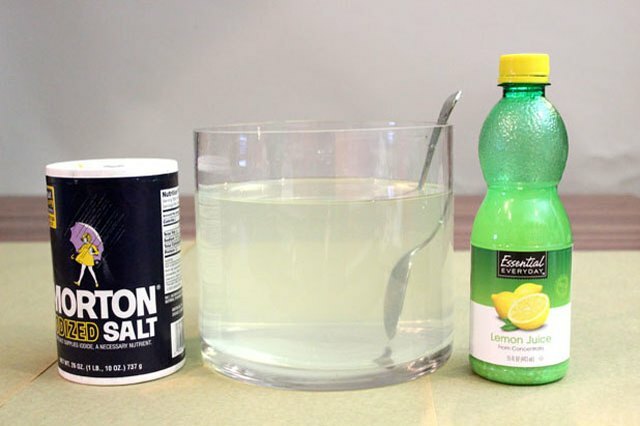 Mix half a cup of salt and half a cup of lemon juice in a half gallon of water. The measurements do not need to be precise. The salt will help draw moisture out of the apples, and the lemon juice will help keep the apple light and uniform in color. Select the largest apples you can find. 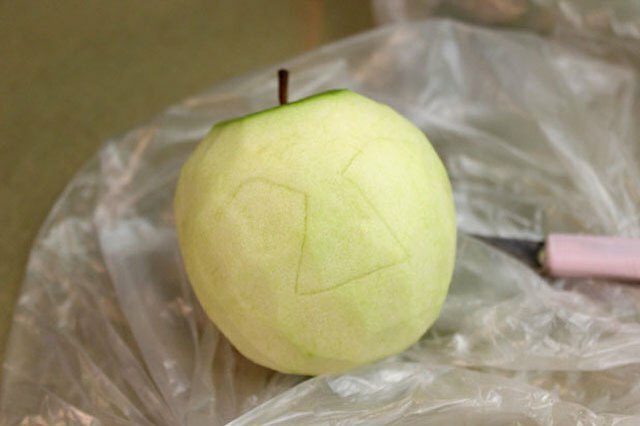 Larger apples are easier to carve, and because they will shrink in size, it's better to start bigger. Any variety of apple will work. Peel the apples, and place in the salt and lemon solution for about 30 minutes. 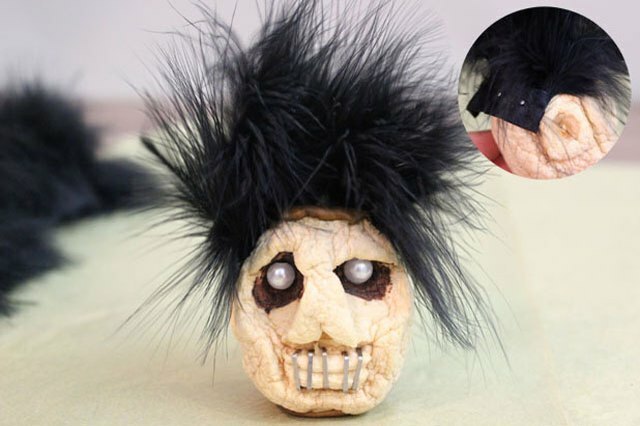 If you leave the tops of the apples unpeeled, the shrunken heads will have little hats (or hairpieces). And if you leave the bottoms unpeeled, you will have a base for the heads to display them. While the most intimidating part of this project is carving the facial features on the apples, remember that the faces are supposed to be distorted anyway, so don't worry about anatomical accuracy. Start by using a sharp hobby knife to outline the eyebrow line and the nose. Cut deep into the apple with the knife. Be careful with the knives when carving the apples. Never let children play with the knives. 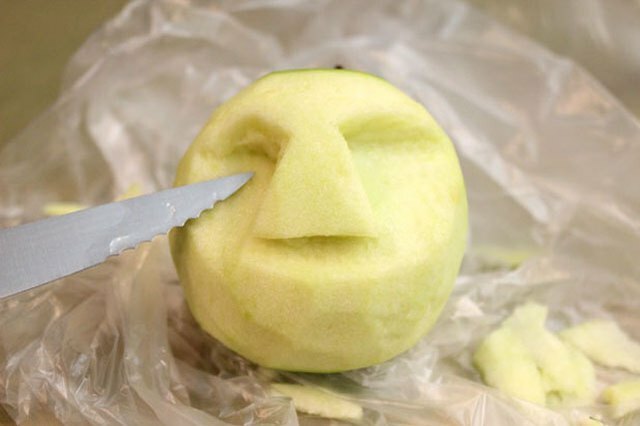 Using the outline you've cut as a guide, carve into the apple with a small kitchen or steak knife so that the eyebrows and nose become more pronounced. Do not worry about making the features symmetrical. This head is not entering a beauty pageant. Carve deeper under the eyebrows to create eye sockets. Under the nose, create a mouth by leaving a horizontal section of the apple uncarved, and then cutting a slit in the middle of this section to make lips. When you're finished with each apple, place it back in the salt and lemon solution. Cut 12-inch pieces of wire. Poke them through the tops of the apples and out the side, twisting the ends together to secure the apples. Then use the wires to hang the apples from the middle rack of the oven. Turn the oven to its lowest temperature, about 170 degrees, and allow the apples to dry out in the oven for a full 24 hours. The oven does not need to be on the entire time. Turn it off when you leave the house or go to bed. 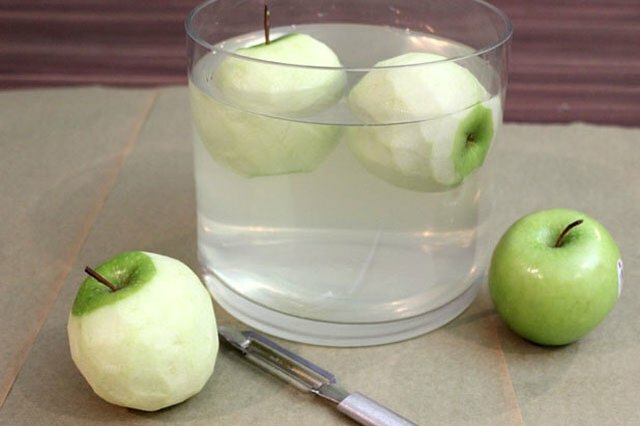 Note: Instead of drying the apples in the oven, they can dry naturally in a low-moisture area of your home. This process will take at least a week, however, so give yourself plenty of time before you need the shrunken heads. After 24 hours in the oven, the faces will be shriveled and bumpy, which is how we want them to look. If your apples are larger and need more shrinking time, that's fine. When your apples have reached the desired shrinkage, remove the apples from the oven, and the wires from the apples. The meat on the apples will be stretchy at this point, so you can use your fingers to accentuate any features. Color the eye sockets with a brown permanent marker. The marker adds a hollowness to the eyes and makes them look tormented. 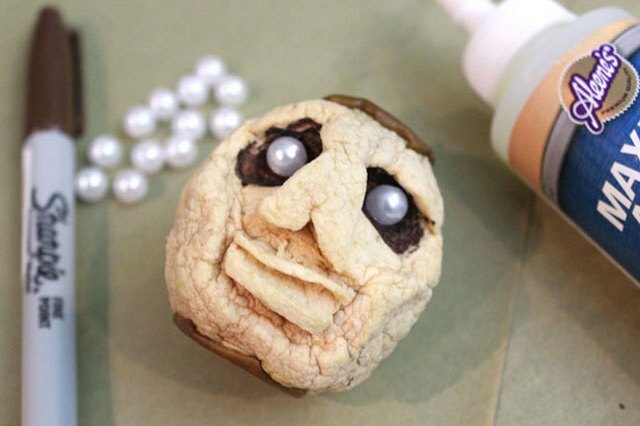 For the eyeballs, attach a pearl bead in the eye sockets with some craft glue. To make it look like the mouth has been sewn shut, insert staples across the mouth. They should just poke right in without the need for any adhesive. While you can use any type of staple, the staples for staple guns are thicker and therefore more visible. Although the shrunken heads have a little apple peel cap at the top, adding a mop of hair makes them even more lifelike -- and sinister. Many elements can look like hair, such as yarn or cotton balls. 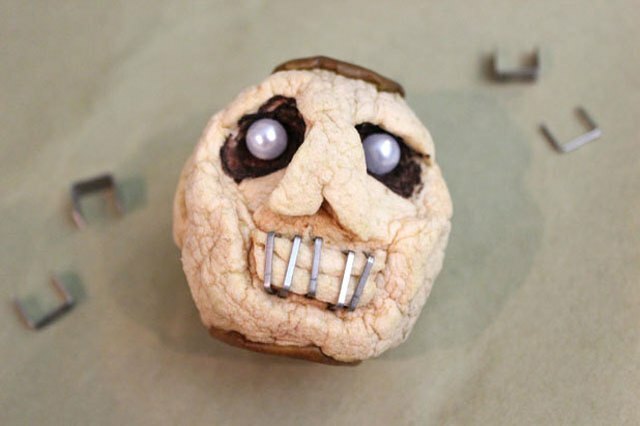 These heads feature fur trim, which has been pinned onto the apple. 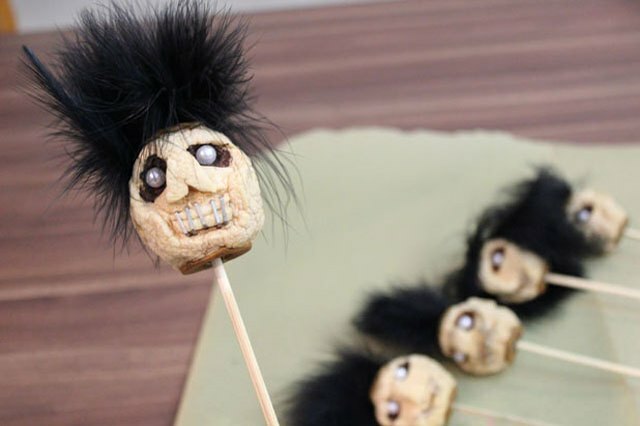 Give each of your shrunken heads a different hairstyle. While the shrunken heads can just sit on a table, inserting a skewer through the bottom of each of the heads makes for a creepier display. Place some dry floral foam in a bowl or decorative container, and stick the skewers into the foam. You can also insert the skewers in the soil of your houseplants, or place them in a vase for display. 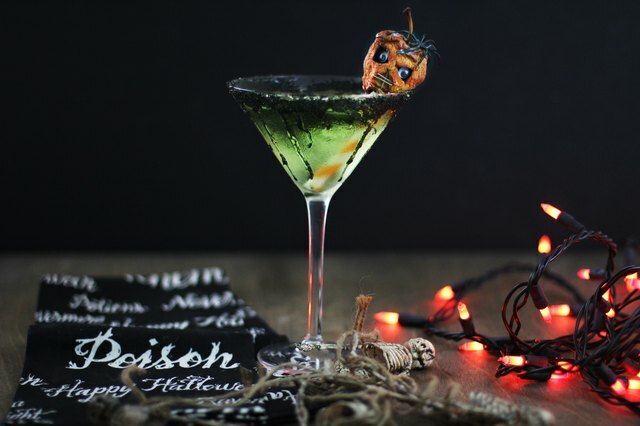 Try carving shrunken heads out of mini apples and use them as a garnish for a spooktacular apple martini!